As drones have become an integral part to running a successful events photography business, you need somewhere to turn to keep you safe and legal. PPA has the resources available for you to take to the skies…and push your photography further. Below you'll find resources to enhance your understanding of insurance options and waivers for your device, information and guidelines for flying, compensation and pricing, safety and etiquette, business applications, and more. Want to set yourself apart from the rest of the pack? Learn more about PPA's Drone Certification and get certified! Or find everything you need to know about and keep up with the ever-evolving FAA Drone Regulations. PPAedu has an extensive library filled with hundreds of educational videos on topics that may interest you. They are here to help you learn how to incorporate drones in your business. Aside from being interesting, these videos are packed with loads of information to help you brush up on, or learn more about photography. There are few technologies today with more conflicting regulations and misinformation than that of the legal operation of small unmanned aircraft systems, more commonly referred to as drones. Let's start with the basics: aircraft registration, operator licensing, and insurance. Add a DRONES Clause to Your Contracts! PPA knows it's important to make sure our members are ready for anything. That's why we have done some of the work for you! Now, under the forms and contracts section, exclusively for PPA members, is a Drone Clause that you can add to your existing contract. Click here to go straight to the FAA’s website and get first-hand information on how to register your drone, rules for flying, and how to become a drone pilot. In this video, Randy and Stacy give a brief overview of the DJI drone hardware components as well as their DJI Go App. Take a quick tour of the DJI Go App and learn the internal functions of what goes into drone flight. Buying a drone? Watch the video and learn which features you should be looking for when buying your first drone from Randy Braun, director product experience with DJI, and Stacy Garlington, product specialist with DJI. Important key features to look for: price, camera and lens quality, etc. You want a drone that has reliable photographic quality without a complex learning curve. This list includes what I believe are the safest, highest-quality drones that are ready to fly with a miniumum of training. In March DJI introduced its Phantom 4 drone. In many ways, it's a modest upgrade to the Phantom 3; however, major improvements can be seen in some key areas. Curious about what goes into flying a drone? Watch this episode as Stacy shows you a basic overview of flying a drone from the pre-flight checklist to take-off and landing. Get a quick glance at what a drone can do. The FAA will begin to release their first set of UAS facility maps. These maps, which will be released over the next twelve months, show drone operators which areas, and what altitudes a drone can be safely operated. New Military Drone Airspace Restrictions Go Into Effect Today! The FAA recently introduced new restrictions over approximately 133 military facilities that go into effect today, April 14th, 2017. These new restrictions limit drones from flying over the designated facilities to help ensure the military is able to protect sensitive information for national security purposes. Drone Safety, Tips on Flying, & How to Get the Best Drone Photography on PPAedu! While many people enjoy flying drones for personal use, when it comes to flying for commercial photography purposes, you've got to really dot your i's and cross your t's to make sure you start off (and stay) on the right foot. Section 107 Drones regulations have been out less than a year, and drone usage has skyrocketed. Currently, according to the FAA, there are approximately 7,200 registered drones. With such a large increase in drone usage, the number of close calls between drones and airplanes has also dramatically increased. PPA is proud to offer both equipment and general liability insurance for drones to members who use drones as a part of their photography business. Both insurance plans are great on their own, but work even better together to protect you as a photographer. PhotoCare Plus covers loss and any damage to equipment, including drones. Adding the drone specific general liability plan on top of PhotoCare Plus extends your coverage to include bodily injury and property damage to others. Combining both plans ensures that you have all your bases covered just in case something goes wrong. Below you will find the details of the individual plans and how you can go about signing up. Operation of drone must be in connection with paid assignment for your business. Coverage extends to Bodily injury and Property Damage of others. Call our team at 888-202-1526 to secure your coverage today. Thanks to new regulations enacted this fall, it's now easier than ever to add drone photography to your business. But beyond passing the FAA's aeronautical knowledge test and being vetted by the TSA, you'll also need something else: insurance. PPA is pleased to introduce a new General Liability Endorsement exclusively made for UAS/Drone operators! Aerial photographer Parker Gyokeres first started experimenting with drone photography as a public affairs photojournalist in the U.S. Air Force. On assignment to document various operations, Gyokeres often wanted to get more elevated perspectives, but he couldn't get high enough with a ladder or on a building. Drone imaging has given us a new way to obtain unique camera angles. Let's take a look at some of the details you'll need to consider when planning these compositions. So you want to fly a drone? First learn the safety, rules and proper flying etiquette before you take flight. Randy and Stacy will discuss the basic safety procedures that go into flying a drone. This episode will also briefly explain the FAA flight rules and regulations. There it is: Your spanking new Remote Pilot certificate from the FAA. You can now fly a drone and get paid for it! The potential is huge because low-altitude aerial photography can immediately differentiate your business. Mistakes in drone safety could result in destroyed equipment, injuries, fines, and possibly even jail time. No matter what time of the year it is, you cannot fly a drone in the D.C. airspace. Have Drone Questions? Get Solid Answers from a PPA Pro! In the past four months, all everybody seems to be talking about are Drones. Between trying to figure out the new FAA regulations, deciding what type of drone to get, studying for the FAA certification test, and making sure you are properly insured; it can make anybody's head spin. 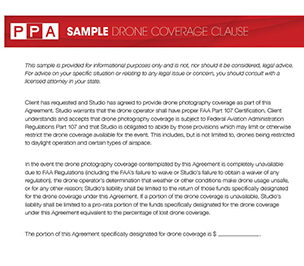 This sample drone contract rider can be inserted into your event photography agreement. Many members have asked PPA about Section 107 Drone Waivers and how they can apply for them. Well, have no fear; PPA is here to give you tips to ensure your waiver will be granted. Breaks the test down step by step and also puts extra emphasis on areas that many members found difficult. It's been a year since the introduction of the Section 107 drone regulations and many photographers are still extremely excited! As more and more photographers look to incorporate drones into their businesses, the FAA is attempting to stay on top of the influx of waivers that are coming in. As a part of our drone waiver series, we will continue to talk about the 9 waivers drone photographers can apply for under the section 107 regulations. As a continuation of our Drone-Waiver series, today we're going over how to obtain a section 107.31: Visual Line-of-Sight wavier. This week PPA's drone-waiver series addresses Section 107.33, also known as "Visual Observer". Every month PPA hosts FREE photography webinars, and the next one takes place on August 14th at 2pm ET. The webinar is titled “Let it Shine: Unlocking the Secrets of Creation Imagery- Part One” with Cris Duncan.